A proper combination of pipe size and gas velocity, calculation of the resulting pipeline pressure drop and a selection of appropriate equipment for moving the gas and separating the solids from the gas at the end of the line are the necessary inputs in the design of a dilute phase transport system. Optimal design requires that in both horizontal and vertical dilute phase transport the system operates at the lowest possible velocity in order to minimize frictional pressure loss, reduce attrition and corrosion effects and, as a consequence, running costs. Given a specific pipe size and solids flow rate, the saltation velocity is always higher than the choking velocity, so that in a transport system comprising both vertical and horizontal lines, the gas velocity must be selected to avoid saltation: if we avoid saltation, choking will also be avoided. These systems would ideally operate at a gas velocity slightly to the right of point D in previous figures. However, USALT is not known with great confidence and so conservative design leads to operate well to the right of point D with the consequent increase in frictional losses in order to remain in the dilute phase. A factor suggesting prudence in selecting the design velocity is the fact that the region near to point D is unstable, and slight perturbations in the system may trigger the saltation velocity mode. If the system consists only of a lift line, the choking velocity becomes the important design parameter. As previously mentioned, UCH cannot be predicted with confidence either (50% error or higher), and conservative design is necessary too. 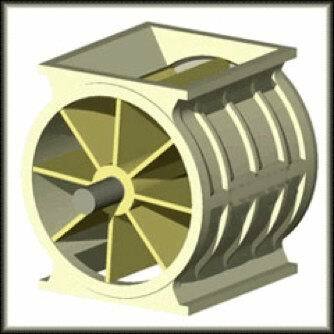 In systems using centrifugal blower, characterized by reduced capacity at increased pressure, choking can almost be self-induced. If a small perturbation in the system gives rise to an increase in solids feed rate, the pressure gradient in the vertical line will increase, resulting in a higher back pressure at the blower, and generating a reduced volume flow of gas. A reduced volume of gas means higher pressure gradient, and the system will soon reach the choking condition. When this condition appears, the system will rapidly fill with solids and can only be restarted by draining off all the solids. When selecting the operating gas velocity, the uncertainty in the correlations to predict choking and saltation velocities suggests that a safety margin of 50% or greater is recommended. Previously derived equations in general apply to any flow of gas-particle mixture in a pipe. In order to make the equation specific to dilute phase transport, expressions for gas-to-wall friction and solids-to-wall friction are required. In dilute transport, the gas-to-wall friction is often assumed independent of the presence of the solids and so the Fanning friction factor for the pure gas may be used. Several approaches to estimating solids-to-wall friction are present in the literature. As an example, the modified Konno and Saito (Konno, H. and Saito, S. J. (1969) ‘Pneumatic conveying of solids through straight pipes’,Chem. Eng. Jpn, 2, 211–217.) correlation for estimating the pressure loss due to solid-to-pipe friction in vertical transport and the Hinkle (Hinkle, B. L. (1953) PhD Thesis, Georgia Institute of Technology) correlation for estimating this pressure loss in horizontal transport can be applied. Hinkle correlation assumes that particles lose momentum by inelastic collision with the pipe walls. The presence of bends complicates the design of pneumatic dilute phase transport systems, and when designing a transport system, to use as few bends as possible is usually a good idea. Bends increase the pressure drop in a line, and they are also the points of most serious erosion and particle attrition. The centrifugal force encountered by the particles while travelling around the bend pushed solids normally in suspension to move towards the walls. As a consequence, the particles tend to slow down; they are re-entrained and re-accelerated after they pass through the bend, resulting in the higher pressure drops associated with bends. A vertical–horizontal pipe configuration tends to increase the erosion and pressure drop effect. If this type of bend configuration is present in a system, it is possible for solids to remain on the bottom of the pipe for very long distances beyond the bend before they can be re-entrained in air. For this reason, it is recommended to avoid completely down flowing vertical to horizontal bends in dilute phase pneumatic transport systems. It was generally accepted that gradually sloped, long radius elbows would reduce erosion effects respect with 90 degree elbows and increase bend service life. Zenz (Zenz, F. A. (1964) ‘Conveyability of materials of mixed particle size’, Ind. Eng. Fund., 3(1),65–75) recommended using blinded tees instead of elbows in pneumatic transport systems. His study highlighted the effect of a cushion of stagnant particles collected in the blinded branch of the tee, suggesting that the conveyed particles impinging upon the stagnant particles in the tee rather than on the metal surface would result in a mitigated erosion effect. Bodner (Bodner, S. (1982) Proceedings of International Conference on Pneumatic Transport Technology,Powder Advisory Centre, London.) tested the service life and pressure drop of various bend configurations. The results showed that the service life of the blinded tee configuration was better than any other configuration tested, giving a service life 15 times greater than that of radius bends or elbows. This was due to the cushioning effect of particles in the blinded branch of the tee, which he observed in a glass bend model. He also reported that pressure drops and solid attrition rates for the blinded tee were approximately of the same order of magnitude as those observed for bends with radius. At present there is no reliable method of predicting accurate bend pressure drops other than by experiment for the actual conditions expected. In industrial practice bend pressure drop is often approximated by assuming that it is equivalent to approximately 7.5 m of vertical section pressure drop. Dilute phase transport is carried in systems in which the solids are fed into the air stream: solids are fed from a hopper at a controlled rate through a rotary air lock into the air stream. The system may be positive pressure, negative pressure or employ a combination of both. Positive pressure systems are usually limited to a maximum pressure of 1 bar gauge, and negative pressure systems to a vacuum of about 0.4 bar according to the types of blowers and exhausters used. The rotary valve is the most commonly used device in general industry for feeding materials into pipelines, consisting in a bladed rotor working in a fixed housing. In many applications in which it is used its primary function is as an air lock, and so it is often referred to as a rotary air lock. This basic type of valve is generally suitable for free flowing materials. It is a positive displacement device and so material flow rate can readily be achieved by means of varying the speed of the rotor. As previously mentioned, there are many different definitions of dense phase transport and of the transition point between dilute phase and dense phase transport, but we can define in general dense phase transport as the condition in which conveyed solids are not entirely suspended in the gas. The transition point between dilute and dense phase transport is the saltation velocity for horizontal transport and choking velocity for vertical transport. Nonetheless, within the dense phase regime several different flow patterns can occur in both horizontal and vertical transport. Each of these flow patterns presents particular relationships between gas velocity, solids flow rate and pipeline pressure drop. In the following figure five different flow pattern zones are identified within the dense phase regime for horizontal transport. Transport in the continuous dense phase form requires very high gas pressures as the solids fill the entire pipe; this transport mode is limited to short straight pipe lengths and granular materials having a high permeability. Discrete plug flow in which discrete packets or plugs of solids occupy the full cross section of the pipe. Dune flow in which a layer of solids settled at the bottom of the pipe moves along in the form of rolling dunes. A combination of dune flow also known as plug flow in which the rolling dunes completely fill the pipe cross-section but without discrete plugs. Saltating flow is localized at gas velocities just below the saltation velocity: particles are conveyed in suspension above a layer of settled solids, and they may be deposited and re-entrained from this layer. Decreasing the gas velocity increases the thickness of the layer of settled solids moving towards a dune flow regime. Not all powders exhibit all these flow patterns and within any transport line it is possible to find more than one regime. The main advantages of dense phase transport compared with dilute phase transport arise from the low gas requirements and low solids velocities. smaller pipelines and recovery and solids/gas separation are required. Moreover, since the solids are not suspended in the transport gas, it may be possible to operate without a filter at the receiving end of the pipeline, reducing maintenance problems. B) Low solids velocity means that abrasive and friable materials may be conveyed with minor pipeline erosion or product degradation. Optimal choice of dense phase transport system depends on the characteristics of the different flow patterns. and requires very high pressures. Saltating flow occurs at a velocity too close to the saltation velocity and is therefore unstable, offering little advantage in the area of gas and solids velocity. We can consider now the discontinuous dense phase flow pattern with its plugs and dunes. Performance in this area is unpredictable, as complete pipeline blockages can appear and it requires high pressures. Most commercial dense phase transport systems operate in this flow pattern incorporating controlling systems of plug length in order to increase predictability and reduce the chance of blockages. Relationships between pressure drop and plug length are not well known. Contradictory experimental evidence is reported in the literature. Klintworth and Marcus (Klintworth, J. and Marcus, R. D. (1985) ‘A review of low-velocity pneumatic conveying systems’, Bulk Solids Handling, 5,(4), 747–753) reported a possible explanation of these apparent contradictions citing the work of Wilson (Wilson, K. C. (1981) ‘Analysis of slip of particulate mass in a horizontal pipe’, Bulk Solids Handling, 1, 295–299) on the effect of stress on the deformation within the plug.